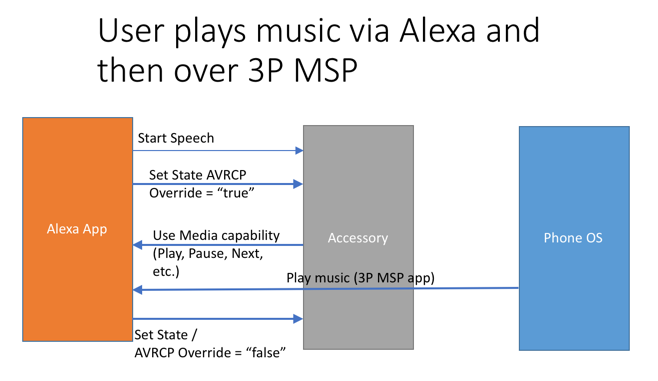 In this use case, a user initiates music through a 3P Music Service Provider (MSP) app, and then interrupts playback through an Alexa interaction. Because the user does not initiate music playback through Alexa, the Alexa app cannot control playback. In this scenario, the Alexa app sends a media control command that the accessory converts to an AVRCP command to interact with the phone OS. The user initiates music through the 3P music provider app. Alexa initiates a speech interaction by sending a Start Speech message. Alexa enters a Listening state and then processes the request then sends a Media Control Pause message to the accessory. The accessory converts the Media Control Pause message to an AVRCP pause command, and sends the AVRCP pause command to the Phone OS, which pauses the music. Any associated Text-to-speech (TTS) commands continue on the A2DP protocol. After the TTS command ends, the Alexa app sends a Media Control Play message. 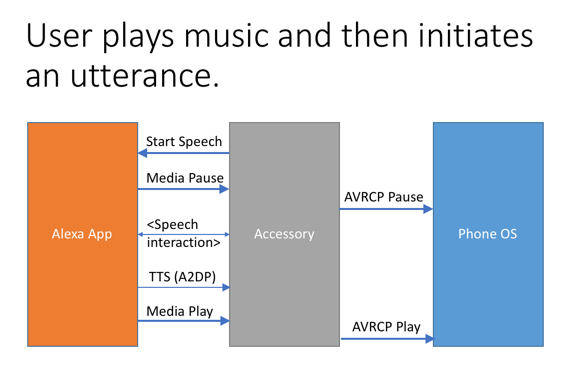 The accessory coverts the Play message to an AVRCP Play command so that the music resumes playing locally.